Craig Bennett’s newest exhibition, Repurposed, will open on Wednesday 13 February at Moran Gallery in Sylvania. The free exhibition runs until 7 April 2019 and is open daily from 10am until 4pm. 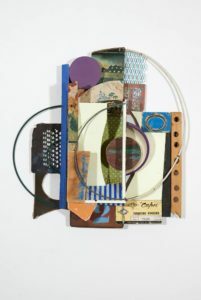 The artworks are made exclusively with found materials or objects. By manipulating these materials, changing their shape and colour and incorporating them into an artwork the unwanted becomes wanted, the crude becomes elegant and the rejected becomes valued. The use of found materials in art is not new. For over 100 years, European artists working in major art movements such as Cubism, Dada and Futurism have explored this medium. “I have been working exclusively with found materials or objects for the past 25 years. My works are purely abstract compositions. I do not aim to recreate anything from the real world; however often viewers can see certain things that I never intended to represent. I am happy for people to interpret my work in their own way” said Mr Bennett. A free artist’s talk will be held in the Moran Gallery on 20 February at 1.30pm – all welcome. Craig Bennett is a southern Sydney artist who completed a Bachelor of Fine Arts with First Class Honours at The College of Fine Arts UNSW. He was awarded a 3 month residency at Cite des Arts Paris and also travelled to Hannover and Lipzig, Germany to study the work and life of German born artist Kurt Schwitters (1887-1948). He completed a PhD in Fine Arts and also began casual lecturing in Painting and Drawing at COFA in 2003. He has exhibited in numerous galleries since 1998. Exhibition: Thursday 14 February to Sunday 7 April 2019 inc. The Moran Gallery in collaboration with Hazelhurst Arts Centre, presents a series of exhibitions which aim to enrich the day to day life of Moran Aged Care residents; their families and the community. The Gallery showcases Australia’s emerging and established artists allowing residents and visitors to experience first-hand the range of diversity of Australian art. The Moran Aged Care, lifestyle and leisure programs encourage residents to explore their own creativity through workshops conducted by the artists on display. The Moran Health Care Group is also a major supporter of Hazelhurst Arts Centre as a Principal Partner supporting active arts programs for the community.